On 12th September, citizenM – the pioneer of affordable luxury hotels – is doing what they do best once again: launching a new hotel and causing further disruption in the traditional hotel industry. The award-winning brand is returning to New York City to throw open the doors of citizenM New York Bowery, a 300-room sister hotel to the citizenM New York Times Square open since 2014.
citizenM New York Bowery continues to build on the brand’s presence in New York, where it opened citizenM Times Square in 2014. Continuing the company’s ambitious rollout, by 2020, the brand will have around 40 properties either open or in development globally – more than doubling its current portfolio. 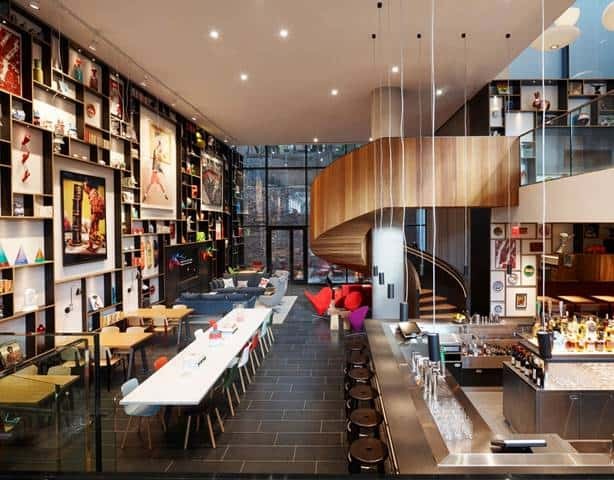 In North America alone, citizenM plans to open a dozen hotels, in major cities that include Seattle, Boston, Washington DC, San Francisco, Los Angeles, and Miami. Since its founding in 2008, citizenM has upended the rules of traditional hospitality by introducing the concept of ‘affordable luxury for the people’. This starts with selecting well-connected locations in the world’s most popular cities, so business and leisure guests spend the shortest possible time commuting. Each property offers a streamlined, luxury experience – including high-tech amenities, friendly and efficient service, luxury guest rooms, and spacious and inviting living areas filled with contemporary art and iconic 21st-century furniture by the likes of Verner Panton, Hella Jongerius and Jasper Morrison from Swiss manufacturer Vitra – all at an affordable price. The new location, which is now taking reservations from 12th September, will be the tallest building in the neighborhood, standing 246 feet high on the oldest thoroughfare in Manhattan, with an expansive cloudM rooftop bar, outdoor terrace, and spectacular 360-degree views of New York. Occupying the entire 21st floor, cloudM features oak cabinets, Vitra chairs and couches, and chandeliers so large, they’ll catch the eye of pedestrians on the street. citizenM’s philosophy of ‘affordable luxury’ is best experienced in the bedrooms. They are smartly furnished with everything modern travelers need, and nothing they don’t. Everything in the room is the very best: the bed is XL king-size wall-to-wall with a superb mattress and luxury bedding. An HD TV features a library of on-demand movies, plus streaming options via free superfast Wi-Fi. A powerful shower with full-size shower gel and shampoo (as well as giant fluffy towels) will soothe all long and short-haul travelers. The room ambiance is fully controlled by an iPad – the blinds, the TV, even the lights with changeable colors (and settings like ‘romance’ and ‘movie’).